Missouri's best player is a transfer guard, 6-5 Jordan Clarkson. Illinois' best player and leading scorer is a transfer guard, 6-4 Rayvonte Rice. ST. LOUIS — What truly makes the annual Missouri-Illinois game so special is that the size of the rooting sections is roughly the same for both teams. Half of the anticipated sellout crowd of 22,153 at Scottrade Center late Saturday afternoon will be sporting Tigers’ gold, the other half will be in Illini orange. Just like always. **Missouri’s best player is a transfer guard, 6-5 Jordan Clarkson. Illinois’ best player and leading scorer is a transfer guard, 6-4 Rayvonte Rice. **Missouri’s strength is its three-man backcourt. Clarkson, Jabari Brown and Earnest Ross average 52.6 of Missouri’s 79.0 points per game, or 66.6 percent. Illinois’ three leading scorers also are guards. Rice, Joseph Bertrand and Tracy Abrams have combined for 39.9 points a game, good for 55.8 percent of Illinois’ 71.5 average. **Illinois has what Haith calls a stretch forward in 6-7 Jon Ekey, that is a big man who can shoot 3-pointers (41.7 percent). Ross, also 6-7, gives Missouri the same type of flexibility though he hasn’t shown the same long-range accuracy to this point (32.7). **Both teams include only one player who hails from the St. Louis area. Sophomore forward Ryan Rosburg out of Marquette High starts for the Tigers; freshman guard Malcolm Hill out of Belleville East is getting 12 minutes a game off the bench for the Illini. 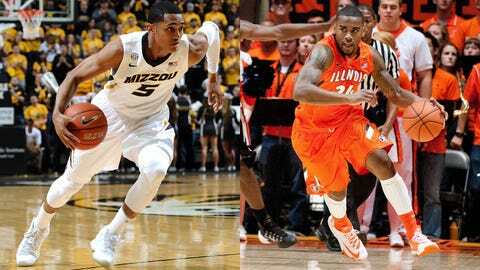 **Both teams return only three players who played in last year’s game, won 82-73 by Missouri. In what was his first start for the Tigers, Brown scored 18 points and had seven rebounds. Ross added eight and Tony Criswell seven off the bench. Bertrand and Nnanna Egwu both scored in double figures for Illinois while Abrams was limited to four points. **The teams even play a similar style of offense, their objective being to have their guards get into the paint and attack the basket or pass to a teammate at the 3-point line. "We mirror each other," Missouri coach Frank Haith agreed after the Tigers’ walk-through Friday afternoon. "They’re attack oriented, they want paint touches, we want paint touches. They drive the ball, they have an athletic front line. Our front line is pretty athletic, too. We’re very much alike." No surprise then that both teams are expecting a close game (So are the sports books; Missouri is listed as a 1.5-point favorite). "A fistfight, in a figurative sense," Illinois coach John Groce said. Look for Rice to be in the middle of the action on both ends. Listed at 235, Rice says he dropped about 30 pounds last season when he was sitting out after transferring from Drake. Now he is quick enough to defend opposing guards and still plenty strong enough to work his way to the basket against any size defender. "When his mind is right, he’s as good as it gets," Groce said. "He can beat you in multiple ways. There’s not a lot of guys in the country that are your team’s most productive offensive player but also guard the other team’s best guy on the perimeter. He has the ability to do both." Against Missouri, Illinois will need Rice’s defense more than his points. He figures to be matched up much of the time against Clarkson, who has proven almost impossible to keep from driving into the paint. Because most of the players on both teams lack experience in the annual Christmas time contest, which Missouri has won four straight years, this is a rivalry that’s mostly for the fans. While Haith says the atmosphere is special, he looks at this game for what it might mean when it comes time to pick the field for the NCAA Tournament. "The biggest thing for us, it’s a game against a high-level team. It’s an RPI game, a resume builder," Haith said. "I think they will say the same thing."